Using the Asterisk Admin GUI you are able to configure most of Asterisk's options without editing the individual configuration files. 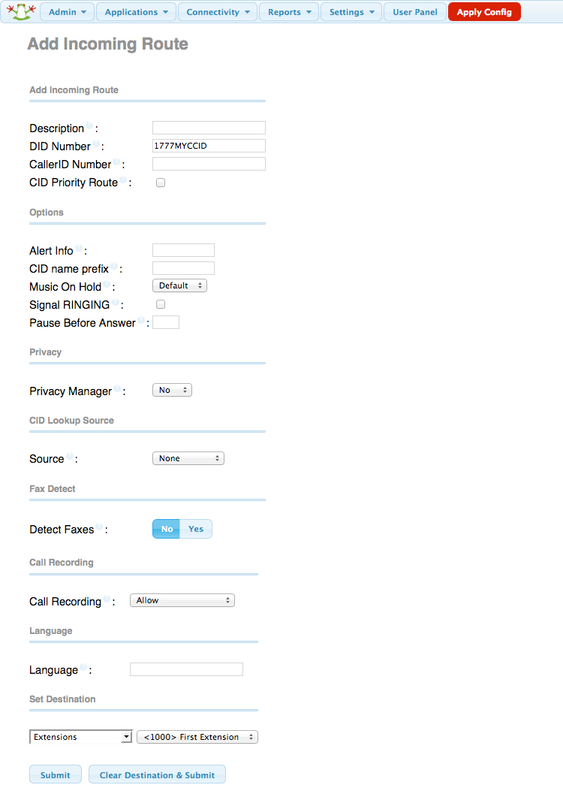 You can also setup advanced options such as call routing, voicemail and other calling features via the GUI Interface. Below we provide some resources which you can visit to obtain further information. 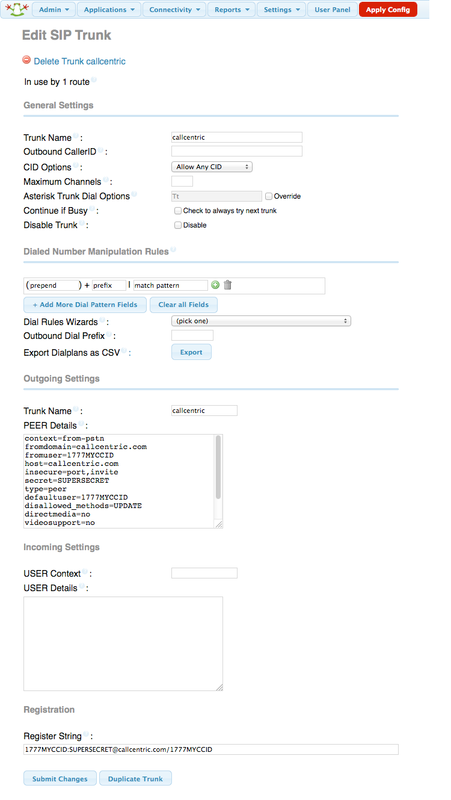 Here we will configure Asterisk through the Asterisk Admin GUI administrative interface to properly route both incoming and outgoing calls to and from Callcentric. This guide assumes that you have installed Asterisk Admin GUI using either the Asterisk Admin GUI package (or distro), trixbox, Elastix, PBX in a Flash or a method of your choice. This guide also assumes that the Asterisk Admin GUI install steps were completed properly and that you have administrative access to the Asterisk Admin GUI administration interface. This guide is based on version 2.11 of Asterisk Admin GUI. We recommend that you read each step thoroughly and in its entirety before performing the action(s) indicated in the step. In the context of this guide a trunk is used to route calls between your Asterisk PBX and your desired VSP(Voice Service Provider), in this case Callcentric. In this section we will configure a SIP trunk. Copy and paste the following into the PEER Details field. If using trixbox/Elastix this will have to be done through the web interface to edit your config files. If using PBX in a Flash, you will need to log in to your server and edit the /etc/asterisk/sip_general_custom.cond file manually, usually with an editor such as nano. We will need to create a local extension on your Asterisk PBX. A local Asterisk extension account on your Asterisk PBX which provides an account number which another UA (software or hardware used for calling) can connect to in order to make and receive calls. There are a few types of extensions. Here we will create a SIP extension. If you have already configured an extension then you may skip this step. 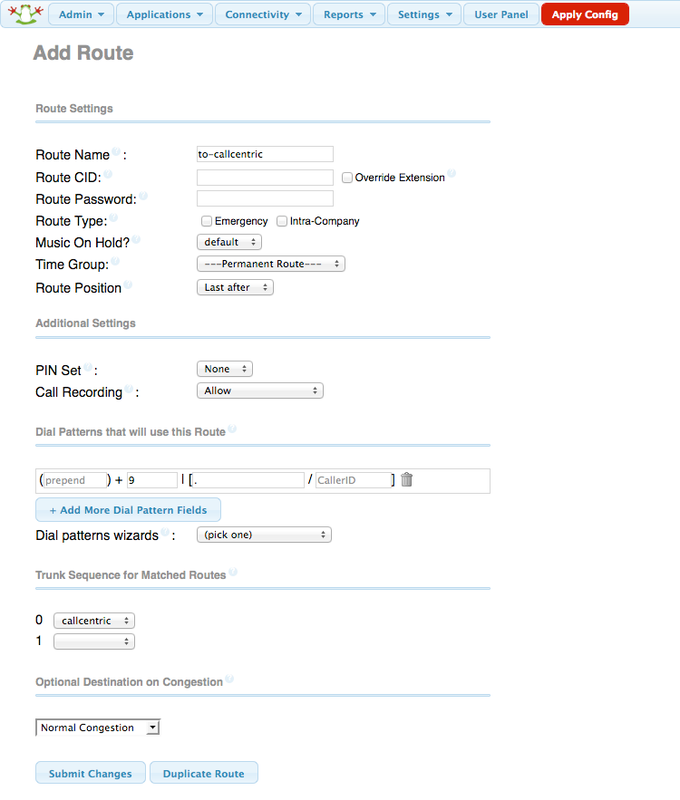 Then in the next step (Inbound Route Configuration) you may use your pre-configured extension. Inbound Route configuration can become extremely complex. With an inbound route you are given the flexibility to send incoming calls to a whole range of destinations. For example you may route an incoming call to a specific extension, to a ring group or to an IVR. In this section we are going to setup an inbound route which will handle ANY incoming calls on ANY number, including emergency numbers, and simply route those calls to a specific extension (1000). Later on you can configure more complex routing schemes, such as DID-Bbased routing. Next you will want to try placing test calls to and from your Asterisk PBX using the UA currently connected to your newly created extension (1000).